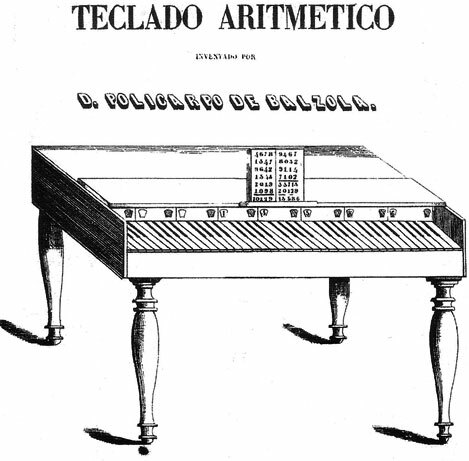 In the middle of 1840s the Basque mathematician and inventor Policarpo de Balzola (1813-1879), from Irún (Guipúzcoa), Spain, (see biography of Policarpo de Balzola) invented his machine Teclado Aritmético (Arithmetic Keyboard)—a calculating machine that had the appearance of a piano (10 years before the similar Piano machine of Thomas de Colmar). In 1846 Balzola described his machine in a manuscript (see the manuscript of Teclado Aritmético) and ordered a prototype (2 x 9 keys) in a piano factory (the wooden case with dimensions 91 x 61 cm) and blacksmith workshop in Irun. The device was presented in several publications in early 1847. In February 1847 it was presented to Spanish Royal Court in Madrid and was highly appreciated. In June it was presented to the Academia de Ciencias (Spanish Academy of Sciences) and described in several publications, for example in the 1 April, 1847, issue of the newspaper Eco de Comercio. The machine is a kind of piano with keys grouped in sections (groups) of nine. Each key represents a digit in the decimal system, so in the section (units section), first key represents one, the second represents two, and so on up to nine: the first key of the second section (tens section) represents ten, the second represents twenty, and so on. Above the the each group of keys there are small windows in which the operator can see the corresponding numbers, engraved on a resulting wheel. The white keys are marked 1, 3, 5, 7, and 9, while the black keys are marked 2, 4, 6, and 8. There is no key for zero. Pressing a key puts in motion a gear wheel, thus entering the corresponding digit into the machine. There is a tens carry mechanism, to pass the motion to the next gear wheel during the transition from 9 to 0. 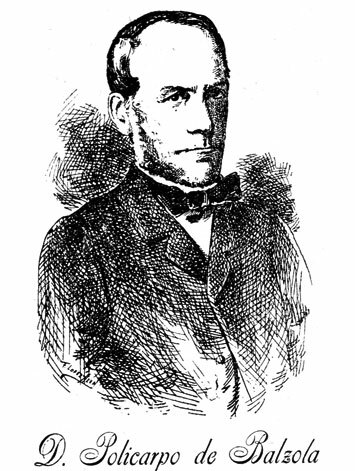 Balzola intended to modify the initial prototype, in order to be suitable for multiplication and division also, and to add an additional mechanism for calculation of fractional numbers, but the modified prototype was destroyed in a fire. The inventor was unable to recreate the machine, because of his limited financial resources.